With one year to go until the UK will leave the European Union (EU), sorting out Britain’s trade relation with the EU is the most important task. Yet the design of the future UK-EU agreement has implications for trade policy towards non-EU countries. On account of this, the British Prime Minister in her Mansion House speech ruled out forming a new customs union with the EU because this “would not be compatible with a meaningful independent trade policy.” Indeed, having sovereignty over its external trade policy post-Brexit has been at the forefront of the UK’s negotiation agenda, and consequently, the provision in the current draft Withdrawal Agreement that the UK may commence Free Trade Agreement (FTA) negotiations with other countries during the transition period was perceived as an important concession won. At the same time, remaining in a customs union with the EU would entail advantages, starting with eliminating (or at least not re-introducing) trade costs. In particular, though, a customs union with the EU is seen by most people as a necessary part of solving the border issue in Northern Ireland. Against this trade-off, we look at evidence from the 16 customs unions currently in existence to see what lessons can be learnt. What is the point of being in a customs union? Countries that form a customs union grant each other tariff-free market access for goods, and also agree on a common external tariff (CET) regime for imports from third parties. Ideally, the CET is comprehensive in that it not only encompasses a common tariff schedule but also covers anti-dumping actions, FTA negotiations and other aspects of trade policy. Hence, in a complete customs union there is no need for Rules of Origin to deflect trade diversion because the regime for imports from outside the customs union is the same at any point of entry. However, even a complete customs union does not by itself achieve frictionless trade amongst signatories. This is because only a customs union combined with elements of the Single Market would obviate the need for border inspections, although a customs union would go some way towards reducing border formalities. At the same time, countries that sign up to a ‘complete’ customs union forgo the ability to set their own external trade policy regime. In the real world, customs unions come in all shapes and sizes. 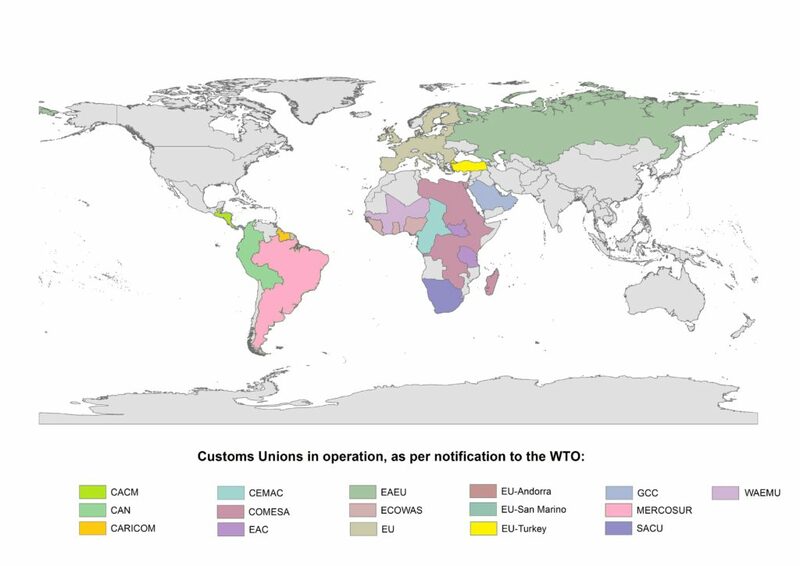 Globally, as of March 2018, there are 16 individual customs unions notified to the WTO (Table 1). Five of these customs unions are bundled with an Economic Integration Agreement and thereby also include services to some extent. Thus overall, and notwithstanding other sources that list further customs unions such as the Swiss-Liechtenstein agreement, there exist relatively few customs unions, particularly in comparison with the large number of Free Trade Agreements in existence today. Source: WTO. ‘Latest change’ dates mostly refer the year of accession of new members to the customs union. Members of a particular customs union tend to be geographically proximate (Figure 1), which is in contrast to FTAs that occasionally encompass partners separated over large distances. The EU Customs Union is complete and further supplemented by the regulatory alignment derived from the Single Market. By contrast, most other customs unions are incomplete in a variety of respects. In particular, many customs unions (and indeed also FTAs) do not cover all goods and thus do not necessarily abolish all internal tariffs within the customs union. For instance, Turkey, Andorra and San Marino each have individual customs unions with the EU. The EU-Turkey customs union does not cover primary agricultural products, coal or steel. Moreover, the institutional structure is lacking with respect to anti-dumping rules or a proper dispute settlement mechanism. Additionally, Turkey must grant access to all EU FTA partners without necessarily receiving the same treatment in return. Other examples include the Southern Common Market (MERCOSUR), which excludes sugar and motor vehicles, or the Central American Common Market (CACM), which does not cover unroasted coffee and cane sugar. Additionally, many customs unions have struggled to fully agree and implement a common external tariff regime. In the Andean Community, the implementation of a CET was suspended in 2007 and parties have instead opted for a less rigid ‘common tariff policy’. The Caribbean Community (CARICOM) and the Central African Economic and Monetary Community (CEMAC) both in principle have a CET in place, but with a wide scope for suspensions and national derogations. Even in instances in which the CET seems to be largely operational, free circulation of goods inside the customs union is still in some cases hampered by the lack of deep integration required to render border controls obsolete. The adoption of a common external trade regime, which is at the heart of forming a customs union, reduces or—in the case of a complete customs union —eliminates the scope for independent external trade policies by its members. Yet there are examples amongst existing customs unions of individual members having signed bilateral trade agreements with third parties outside of the customs union. In the Andean Community, members are allowed to sign trade agreements with third parties when negotiation at the community level is not possible, as long as such agreements do not ‘jeopardise the Andean legal system’. As a result, both Peru and Colombia have separately signed a number of bilateral FTAs with, inter alia, Canada, the United States and Mexico, respectively. Other examples include the Gulf Cooperation Council where both Bahrain and Oman separately concluded FTAs with the United States, whilst the other customs union members have not. Costa Rica is part of CACM but has concluded an FTA with China in 2011. In the case of the Southern African Customs Union, South Africa was the only customs union member to have a trade agreement with the EU until 2016 when the EU signed an agreement covering all SACU members. Beyond the EU case, most customs unions today are incomplete. The different nature and purpose of custom unions around the world has produced a wide array of arrangements, some of which involve a country being a member of a customs union and being party to one or more FTAs. However, such outcomes can only reflect the incomplete nature of the customs union in question. Reduced scope comes with reduced gains, perhaps greatly so. And in contrast to other countries, the UK has to consider the border issue in Northern Ireland. The shared agreement to avoid a hard border may not leave much scope for incompleteness. Just one observation. GATT Article XXIV 8 (a), which defines a customs union, refers to the elimination of durties on substantially all products “originating “in such territories (the same wording as in its definition of FTAs. So it would seem that there is no reason not to have rules of origin in a customs union and, if one has rules of origin, it isn’t necessary to prevent its members from signing their own FTAs with other partners. Admittedly Turkey has agreed to align its trade policy with that of the EU but I assume that it did this as part of the process of preparing for membership of the EU (which seemed a more realistic prospect at the time than it does now) or, at least, preparing to reach the point were there would no need for rules of origin on products there were covered by the Customs Union and did not incorporated products that were not in the Customs Union. Also, there was talk (though only talk that never came to anything) of Brazil agreeing a FTA with the EU when the attempts to negotiate and FTA with Mercosur were blocked by Argentina. I don’t recall it ever being said that this would contravene either the WTO or the rules of Mercosur (but to the extent that I followed this, it was through secondary sources).